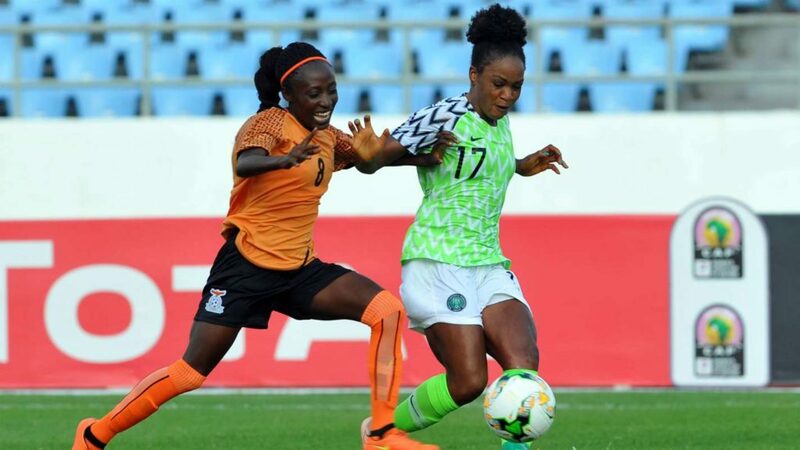 The Super Falcons may have reasserted their dominance on the continent by clinching a record ninth Women Africa Cup of Nations title while also securing qualification to the FIFA Women’s World Cup for the eighth time, but the signs of the times portend a continental superpower in decline whose participation at the World Cup would be pointless without adequate preparation according to Falcons forward Francisca Ordega. Nigeria defeated South Africa 4-3 on penalties at the Accra Sports Stadium to emerge champions of the 2018 Women African Cup of Nations and while that may be the story, the reality is their title triumph papered over the cracks of what was ultimately an unusually difficult tournament for the defending champions. The Super Falcons lost an opening match at the Nations Cup for the first time in their history when they fell one nil to Banyana Banyana in the group stage and scored in just two out of five matches at the tournament – against a Zambian side making only their second tournament appearance and an Equatorial Guinea side that posted the worst defensive statistics in the history of the championships. They relied on penalties to see off a superior Cameroonian team in the semi-finals and repeated the feat in the final against South Africa. While it might seem churlish to worry about a team that has just won a third continental trophy on the trot, the evidence served up by the 2018 Women’s Nations Cup in Ghana, suggests that the gap between Nigeria and other countries is shrinking at a rapid rate. A key reason for this levelling off of the field is that while the competition – South Africa especially – have crafted and implemented deliberate plans aimed at challenging and eventually usurping Nigeria’s place as the preeminent force in women’s football on the continent, Nigeria on the other hand have come to rely on the ‘muscle memory’ that stems from years of continental dominance, believing that even with the most token of preparations, they can always turn up and steamroller their way to the title. But things rarely remain the same and indeed they haven’t and Ordega believes that without proactive measures aimed at preserving their dominance on the continent, the Falcons would struggle to maintain their stranglehold on the Nations Cup in years to come. “It’s going to be difficult [to continue to dominate at the Women’s Africa Cup of Nations] because you can see other teams are coming up,” says the Washington Spirit forward who was named Woman of the Match against Zambia in the group stage and South Africa in the Final. “Who would have ever thought that Zambia would come out to say they want to beat Nigeria but they said it just that we didn’t give them that chance to beat us. South Africa won one zero against Nigeria, in three to four years to come it’s going to be difficult for Nigeria because these people are preparing they’re ready for business but we are not ready,” she says. A particular sore point for the 25-year old who scored two goals at the recently concluded championships was the shoddy preparations in the lead up to the 2018 Nations Cup in Ghana. The defeat of Cameroon in the semi-final saw the Falcons maintain their enviable record of being the only African team and one of just seven teams to have qualified for every edition of the FIFA Women’s World Cup since 1991. With such an exceptional World Cup qualifying record, it is surprising then, that Nigeria have only ever made it past the group stages on one occasion – in 1999. Ordega says Nigeria’s record at the World Cup will only improve if there is a conscious and deliberate effort to prepare the team to make a mark at the World Cup otherwise the Falcons’ expedition to the World Cup in France in 2019 would be a pointless exercise. “I think [the Nigeria Football Federation] should have us have more friendly games because we have a lot of FIFA days so they should utilize the opportunity to bring in the foreigners and home-based [players] together at least once in a while to train together and have top friendly games against [the likes of] Germany, USA, France if not it’s going to be difficult.